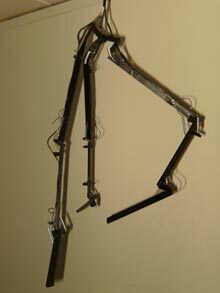 To avoid mimesis the robot's body is a primitive abstraction, a connected system of bare wooden limbs linked by joints. Abstract control schema based on CPGs. 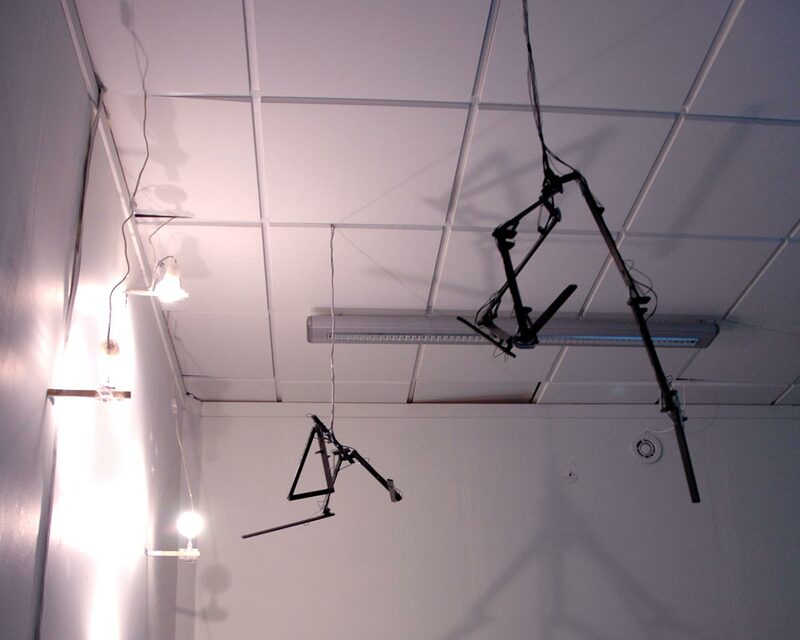 The skeleton of the robots is constructed from straight wooden sticks. The length of the individual limb segments ranges from 18 to 32 cm. Small lightweight plastic hinges are used for the construction of flexible joints. 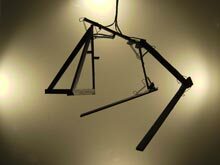 To avoid too complex joint actions and overloading of the structure with too many muscle elements, most joints are equipped with either 1 or 2 degrees of freedom. Several limbs are connected together to form a skeletal body. Nitinol springs and normal metal springs are used to strain the loose modules. The shape memory alloy (SMA) elements employed in this project are made from 750 µm Nitinol-wire and have a coil diameter of 6 mm. 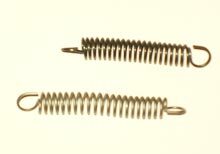 The characteristic behavior of a spring element is defined by the spring constant. The spring constant describes the spring's willingness to deform when a force is applied to it and is therefore a measure of stiffness and strength. The specific feature of springs made from SMA is that their spring constant changes with the metal's temperature. A higher stiffness factor when heated up makes the spring exert more force and causes the contraction movement. While cooling down the spring constant slowly decreases and makes the element stretchable again. When passing a current of 2 A through them, the springs heat up and can contract to 29 mm, when cooled they can be extended to about 14 cm. The activation of the muscle elements is carried out by the physical computing platform Arduino. Variables defining an actuation pattern can be downloaded onto the microprocessor. The Arduino activates the robot according to the parameters of the pattern by operating switches that connect the SMA springs to an external power supply. The motion patterns that control the activation of the SMA springs are derived from rhythmic locomotion behavior in nature. Locomotion is such a common everyday activity that the nervous system created special control units to send out the necessary signals without constant supervision from the brain. The so-called central pattern generator (CPG) consists of sets of interconnected neurons located in the spinal cord. Central pattern generator produce rhythmic activation patterns for several muscles that work in unison to achieve locomotion behavior. The activation patterns for the robot's SMA muscles are defined as a fixed set of variables. Each motion pattern is assigned a main cycle time and a set of 3 variables for each muscle element. The phase, heat and slope parameters are each defined as integer values ranging from 0 to 99. The phase indicates at which step of the cycle the muscle's activation starts. The heat parameter specifies how long the activation lasts by interpreting the value as a percentage of the whole cycle time. The slope parameter defines the length of the PWM controlled fading in and out of the activation.